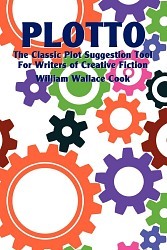 Plotto: The Master Book of All Plots, and its author, William Wallace Cook, were recently featured on BBC Radio, in a program called “Miles Jupp and the Plot Device.” Listen to it here. Jupp also discusses Plotto’s influence on at least one other writer, Erle Stanley Gardner, the creator of Perry Mason. Every story introduced a new crime and new characters, which required a new plot. How prolific was William Wallace Cook? At one point he worked with one, two, or even three stenographers at the same time, dictating one story to each in rotation, and filling in any gaps by sitting down at his typewriter and working on a different story. Is Plotto a magic plotting device? I think it is, sort of. It’s not going to write your novel for you, but when I took Linda Hamner’s excellent scriptwriting course, it was clear that any movie has enough twists and turns to cause serious brain-freeze, and a TV series or a novel is even more daunting. Personally, I think Plotto is a magic device for subplots, especially if you expect not to cut ’em out and paste ’em down, but to use them as a starting point, or even just to jog your brain into coming up with something better.